On Monday, March 2nd, members of the Class of 2015 joined faculty members for a celebratory dinner marking 100 days until Commencement. 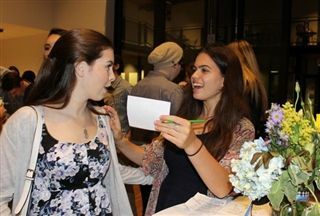 Seniors and teachers acknowledged the bonds of respect and friendship they've developed over the years, during time spent in the classroom, on the playing field, during service learning work and on global adventures. The evening was capped by a fun "then and now" slide show juxtaposing baby pictures with portraits of each senior. The Class of 2015 will join the ranks of Pacific Ridge alumni at Commencement on June 11th.